Delivering the refined aesthetics, fit and finish that your theater, concert hall, and performing arts patrons demand. The Quattro Art Series by Hussey Seating Company lets you re-envision theater with the timeless look of wooden backs and seat bottoms and introduces the concept of dedicated design areas. Learn more here. With our dedicated design spaces or "live areas" you have freedom to create an aesthetic to suit your architectural vision without the traditionally high price tag. Unveil a signature look on the seat bottom, seat back, end panels, arm rests or seat back. The Quattro Art Series is the finishing touch in your architectural masterpiece: It's theater re-imagined. Hussey Seating Company specializes in fixed seats and fixed audience seating that comfortably supports your audience and enhances your space. In stadiums, theaters, lecture halls, auditoriums, performing arts centers and places of worship, fixed seating doesn’t just fix your audience’s attention on the stage—fixed seating is a key part of the stage. 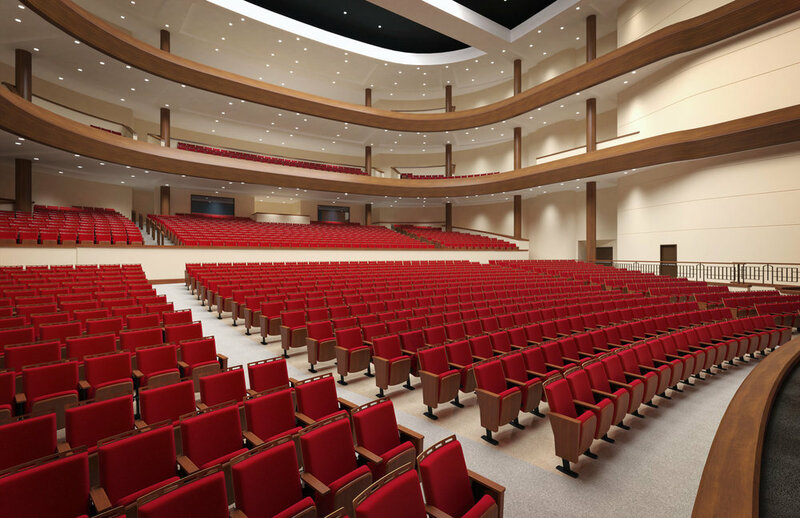 Make inspired design, premium materials, durable construction, rigorous quality control and superior acoustics part of the show when you choose Hussey fixed seating. From top to bottom, every aspect of the Quattro Collection has been designed to balance form and function in beautiful new ways. While you may opt for available end panels, Quattro Collection’s stanchions are designed to be so captivating, they can stand all on their own. Click here for more info. A perfect blend of old and new, the Quattro Traditional Collection has a traditional stanchion and end panel, providing an elegant solution for those who prefer a more classic look. It’s also a perfect solution when retrofitting to match an existing décor. Click here for more info. Designed for high-use environments, the Performance Series is virtually maintenance free, yet still upholds Quattro’s high standards for comfort, style and long lasting performance. Get the luxury of an upholstered indoor chair with the durability of an outdoor stadium seat when you choose Quattro Extreme. Click here for more info. Combining invincible strength with style and comfort, Fusion features contemporary lines, a smooth polished finish and unrivaled performance. Click here for more info. It’s seating fit for a legend. Designed for comfort, durability and value, Legend is a classic choice for the ballpark and beyond. Click here for more info. Perma-Cap® covers enhance and protect your indoor or outdoor bleacher investment, with installation and maintenance costs approximately half that of refinishing or replacing existing seating. Click here for more info.